On Twitter, several people asked how much of the trend is explained by the aging U.S. population. It’s a good question. As I’ve written before, the aging of the baby boom generation explains much — though certainly not all — of the steep decline in the labor-force participation rate, the share of the population that’s working or looking for work. It’s reasonable to suspect that the same trend is driving unemployed workers out of the labor force. But while the aging population may be a contributing factor, it isn’t the primary explanation. A breakdown by age shows that most of the unemployed workers leaving the labor force aren’t boomers. In fact, only 5 percent are of retirement age (65 or older), and most aren’t even close. This shouldn’t be too surprising. Unemployment is concentrated among the young: The unemployment rate for Americans younger than 25 was 13 percent in August, compared to 4.6 percent for those 55 and older. So it makes sense that younger workers would make up an outsize share of those abandoning their job searches. 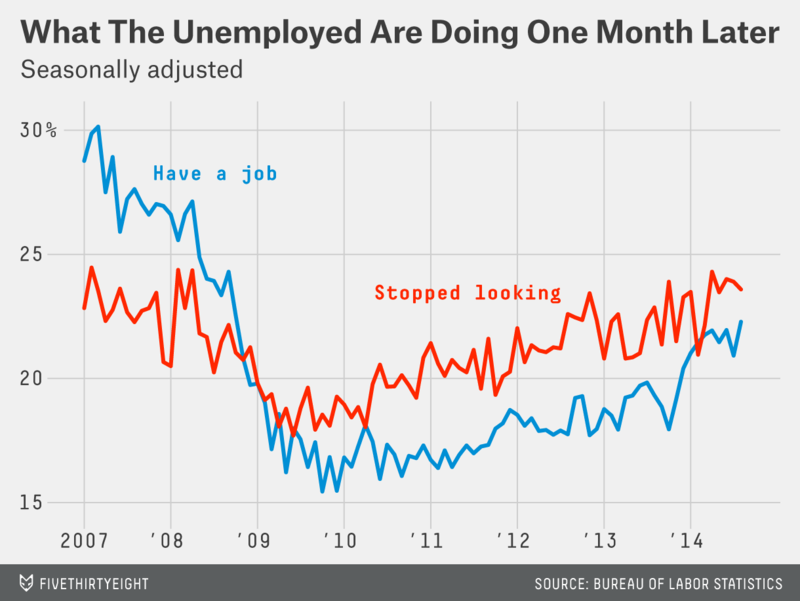 Of course, these figures only look at people who were unemployed, meaning they were actively searching for work. If you look instead at people who left the labor force after being employed, the numbers are much more skewed toward retiring boomers.